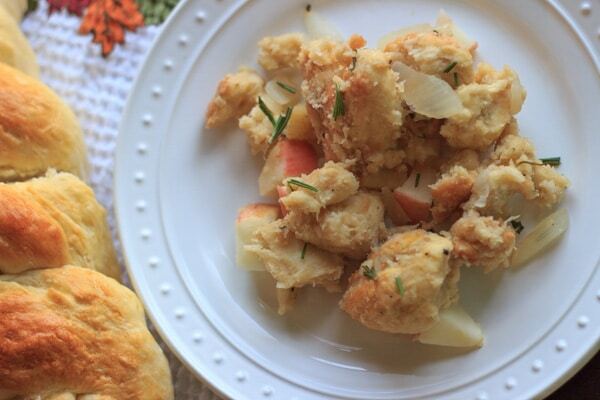 This vegetarian challah bread stuffing will be great at your Thanksgiving table. 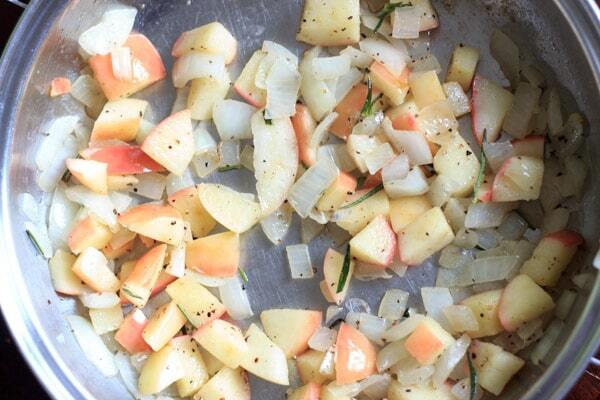 Cooked on the stovetop to save oven space, added apples for crunch, and garnished with fresh rosemary. 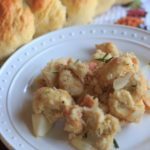 Do you remember my challah bread recipe? 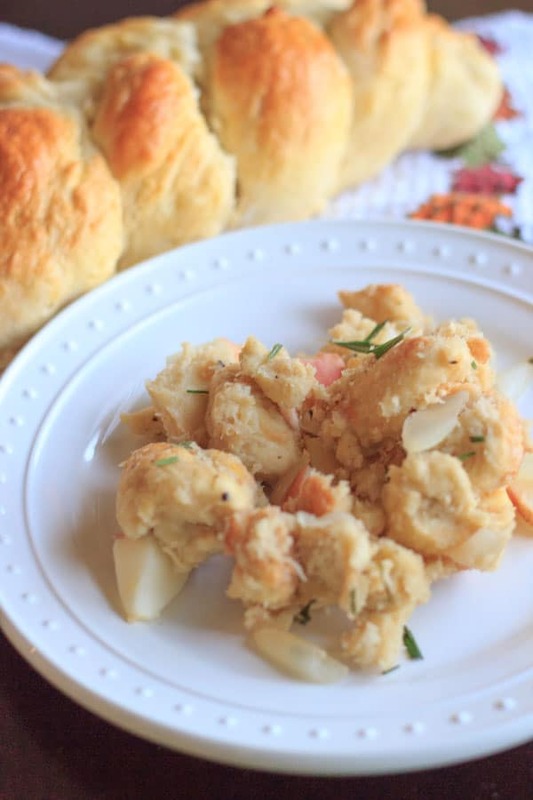 Well, if you have enough willpower to not eat all 3 of the loaves at once, then you can use it in this stuffing! Still with me? Okay. 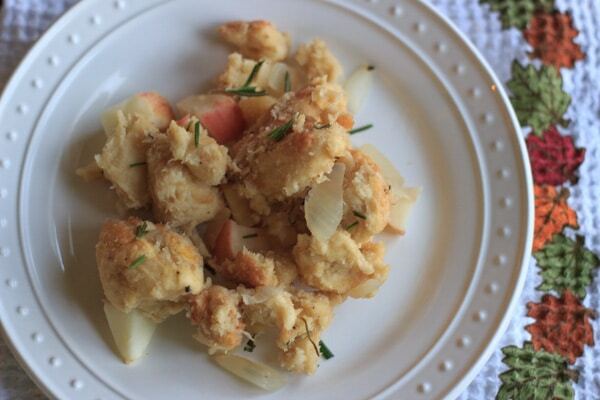 I made this a couple times, once with store bought (gasp) challah and cooking the apples, and a second time with my homemade challah and apples mixed in at the end. The second was better. There are two methods to drying out your bread for stuffing: cooking 1 inch pieces in the oven at 300 degrees Fahrenheit for 6-7 minutes, or using day old bread. With my homemade challah for the second batch, I left one loaf out for a day and thought that worked much better. But if you don’t have time for day old bread, the first method works fine. Even though I preferred the apples crisper, it did look pretty when cooked with the spices. You can saute the apples with the onions if you like, though you may want to add celery or something else for the crunch factor. The whole thing cooked pretty well on the stovetop, though it won’t have the same baked crispness as if you cooked in the oven. The apples are my favorite. Most people use green apples for a slightly bitter taste, though I used red apples and it still tasted great. Don’t be afraid to add more rosemary or other herbs before serving! 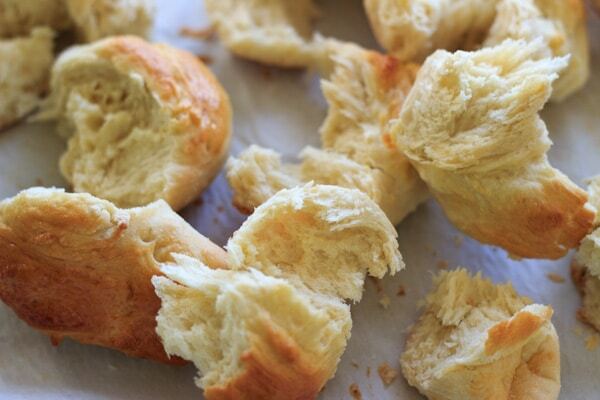 If your bread is slightly stale (dry), continue to next step. If not, cook cubes of bread in preheated oven at 300 degrees Fahrenheit for 6-7 minutes. On medium heat, saute 1 Tablespoon of the butter and onion for a few minutes. Add remaining Tablespoon butter with parsnips and spices, and stir together for a few more minutes. Place cut up bread in a large pot. Pour vegetable broth over bread, add spice and onion mixture from other pan on top and turn pot on low heat. Mix until bread is covered evenly with spices. Cook for additional 10-15 minutes, or until desired consistency. Remove from heat and mix in apples. Add more rosemary, salt and pepper as desired, and serve.